Synopsis: Musical adaptation about an orphan who runs away from an orphanage and hooks up with a group of boys trained to be pickpockets by an elderly mentor. Did You Know? As of 2014, this was the last G-rated film to win the Oscar for Best Picture. This is my friend Jim’s favourite movie, and I could see why with just the opening number: the sweeping panorama of the marvellous set, the illustrious costumes, and the grandiose choreography were stunning. I think Shani Wallis’s performance as Nancy was, at the very least, good enough to garner a nomination for Best Supporting Actress; she was my favourite character. I must confess that, with today’s cinematic technology, I don’t often find myself particularly in awe of films anymore. 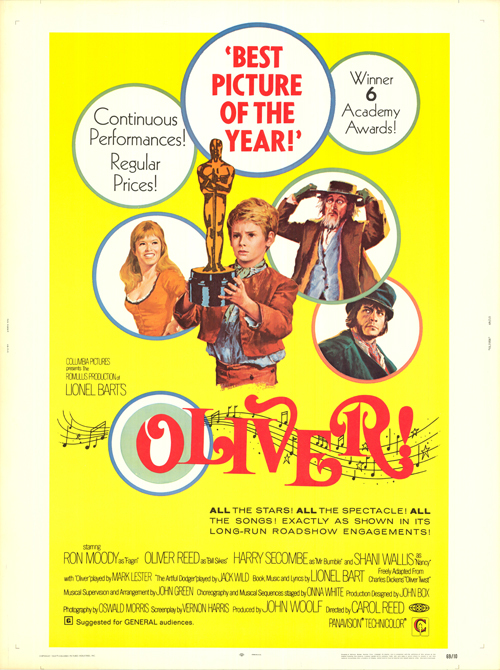 Every so often, a movie will leave me completely awestruck, and I have to say that Oliver! is one of those films. It is, without a doubt, a most beautiful masterpiece of cinema.